The black hole at the center of the super giant elliptical galaxy M87 shown above in cluster Virgo fifty million light-years away, is the most massive black hole for which a precise mass has been measured -6.6 billion solar masses. Orbiting the galaxy is an abnormally large population of about 12,000 globular clusters, compared to 150-200 globular clusters orbiting the Milky Way. The M87 central black hole is fed by a small gas disk, and it powers a highly collimated, energetic jet that penetrates the inner part of the galaxy shown in the ESO image below. 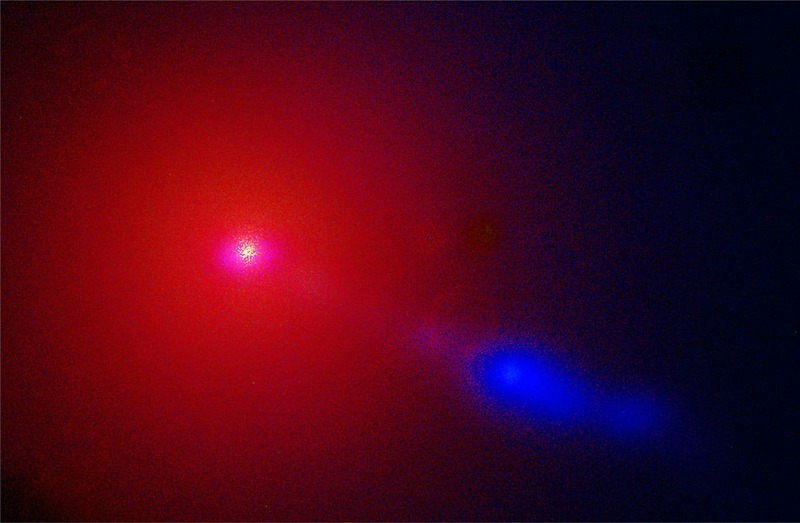 As a typical elliptical galaxy, it primarily contains old, fairly cold stars – they cause the reddish colour of the galaxy in this colour image. The powerful jet, however, is extremely energetic and emits much of its energy in the blue and ultraviolet parts of the spectrum. The jet, therefore, appears bright blue in comparison. This image is a colour composite of three images taken in ultraviolet, blue, and visible light (U, B and V filtres) during the night of May 25 – 26, 1998. In reality, the bright blue color of the jet corresponds to ultraviolet radiation. 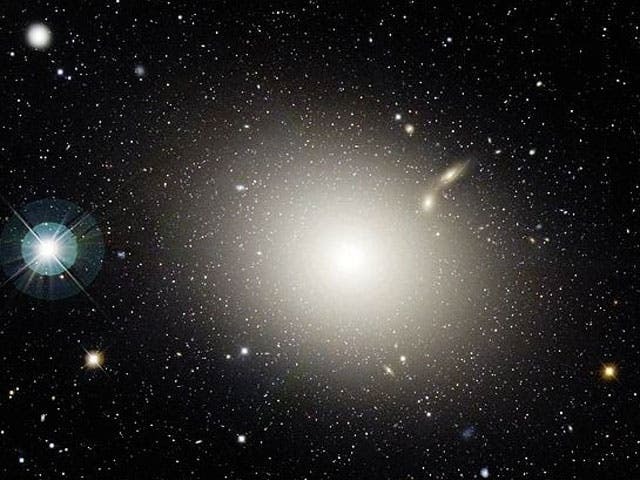 New observations this July with ESO’s Very Large Telescope have revealed that the giant elliptical galaxy Messier 87 has swallowed an entire medium-sized galaxy over the last billion years. For the first time a team of astronomers has been able to track the motions of 300 glowing planetary nebulae to find clear evidence of this event and also found evidence of excess light coming from the remains of the totally disrupted victim. Image credit: ESO and NASA/Canada-France-Hawaii Telescope, J.-C. Cuillandre (CFHT).